The latest, greatest utility-scale battery storage technology to emerge on the commercial market is the vanadium redox battery, also known as the vanadium flow battery. V-flow batteries are fully containerized, nonflammable, compact, reusable over semi-infinite cycles, discharge 100% of the stored energy and do not degrade for more than 20 years. Most batteries use two chemicals that change valence (or charge or redox state) in response to electron flow that convert chemical energy to electrical energy, and vice versa. 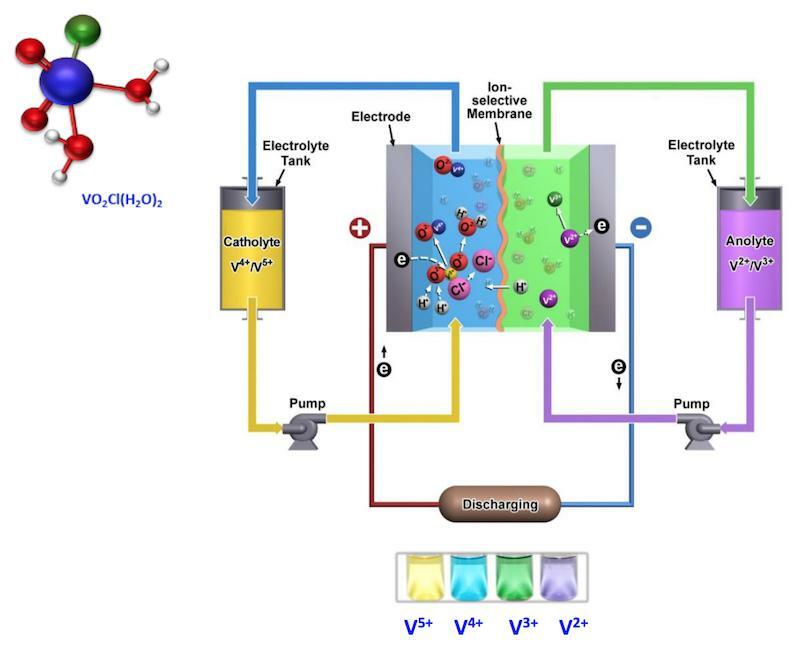 V-flow batteries use the multiple valence states of just vanadium to store and release charges. V can exist as several ions of different charges in solution, V(2+,3+,4+,5+), each having different numbers of electrons around the nucleus. Fewer electrons gives a higher positive charge. Energy is stored by providing electrons making V(2+,3+), and energy is released by losing electrons to form V(4+,5+). Flow batteries consist of two tanks of liquid, which simply sit there until needed. When pumped into a reactor, the two solutions flow adjacent to each other past a membrane, and generate a charge by moving electrons back and forth during charging and discharging. This type of battery can offer almost unlimited energy capacity simply by using larger electrolyte storage tanks. It can be left completely discharged for long periods with no ill effects, making maintenance simpler than other batteries. Because of these unique properties, the new V-flow batteries reduce the cost of storage to about 5¢/kWh. These batteries are rather large and best suited to industrial and utility scale applications. They could never fit in an electric car, so the Tesla battery is safe for now. But the V-flow battery outcompetes Li-ion, and any other solid battery, for utility-scale applications. They’re just safer, more scalable, longer-lasting and cheaper – less than half the cost per kWh. New battery technology is essential in our new energy future. According to the U.S. Energy Storage Monitor, energy storage demand, especially at the business and utility scales, will increase ten times in just the next five years, fueled in major part by the extension of the federal Investment Tax Credit (ITC) for five more years. The Energy Storage Association states that corporate investments in energy storage reached $660 million in just the third quarter of 2016. UniEnergy Technologies (UET) of Seattle produces the largest MW-scale vanadium flow batteries yet, using a molecule developed at the Pacific Northwest National Laboratory. PNNL’s breakthrough was to introduce hydrochloric acid into the electrolyte solution, almost doubling the storage capacity and making the system work over a far greater range of temperatures, from -40°C to 50°C (-40°F to 122°F), removing a large previous cost of maintaining temperature control. Presently, the largest installed V-flow battery in the U.S. is a UET 2MW/8MWh (power/total dischargeable energy in a single full charge) system in Washington State at the Snohomish County Public Utility District’s Everett Substation. This vanadium battery can keep the lights on in 1,000 homes for eight hours. A V-flow battery system planned for Dalian China by UET’s sister company Rongke will soon be the largest battery in the world at 200MW/800MWh. No matter how you cut it, energy storage has generally been very expensive. And no matter how good ordinary batteries are, they cost about 30¢ to store 1 kWhr, essentially tripling the cost of generating that energy. Storage has primarily been done only when necessary for logistical reasons, like storing solar power generated that day for use that night in a remote area. Or when you want a flashlight to use without dragging a hundred-foot cord around. No one thinks about the absurdly high cost of that electricity since it’s usually such a small amount needed to power a flashlight or a remote appliance. Twenty hours of continuous use, more or less, is what you’ll get from a common battery. But storing energy for the future is becoming more important as power generation evolves and we need to be more creative, and less costly, than we’ve been so far. Hence, the importance of the V-flow batteries. In addition to batteries, there are other technologies for storing intermittent energy, such thermal energy storage. However, the most widely used storage method is pumped hydro storage, which uses surplus electricity to pump water up to a reservoir behind a dam. Later, when demand for energy is high, the stored water is released through turbines in the dam to generate electricity. Pumped hydro is used in 99 percent of grid storage today, but there are geologic and environmental constraints on where pumped hydro can be deployed. For now, V-flow batteries offer the best deployable large battery storage technology developed thus far.